I only had the good fortune to meet Ron Hockett in person once — at a John Sheridan Dream Band session for Arbors Records at Nola Studios in Manhattan. Of course I’d heard him play before, so it was a pleasure to speak to him, but even more than his playing, I was impressed by his easy kindness, the quiet spirituality he brought in to the room, even when he was sitting silently, listening to a playback. In February, Ron received a diagnosis of idiopathic pulmonary fibrosis, which is a chronic and progressive scarring of the lungs which eventually leads to respiratory failure. There is no cure, the only real treatment is a lung transplant. He is now a patient at Duke . . . and if all of the testing/evaluations/pulmonary rehab goes well, he will be listed for transplant. He has a five day evaluation in August. He is on supplemental oxygen with exertion but he can still play the clarinet thus far! It is our biggest hope that all of this will happen and that he will be healthy, will once again be able to travel and play larger gigs, see his friends, and of course be able to breathe! As you can imagine, the cost is enormous and he and my mom will be forced to relocate for a year or so. I’ve just started a fundraising campaign on GoFundMe. And here’s some lovely music that I hope will evoke generous feelings and actions. Let us do a friend a favor. Energy. Ready, alert, masterful. Focused, intent, ready to explode. Rhythm embodied. Ferocious, delicate. Precise, abandoned. Thanks to Sonny McGown for this photograph. Thanks to Jo Jones for undying beauties of sound, of passion, of wit. I suspect that most people, asked to describe “a jazz record collector,” would create at best a gentle caricature. It wouldn’t be too far from the general stereotype of someone who assorts, covets, arranges, and studies any kind of ancient artifact. In the imagined cartoon, the man showing off his prize collection of mint Brunswick 78s by the Boswell Sisters is simply a cousin of the museum curator, happily dusty. 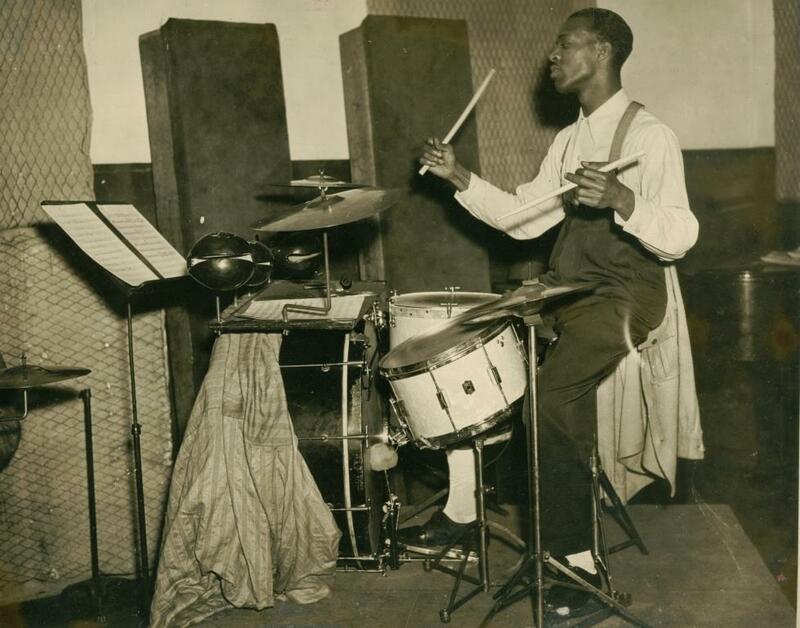 But stereotypes are meant to be exploded by reality, and many jazz record collectors have seen the daylight and know that there is life beyond the shelves, beyond their notebooks of sought-after discs. 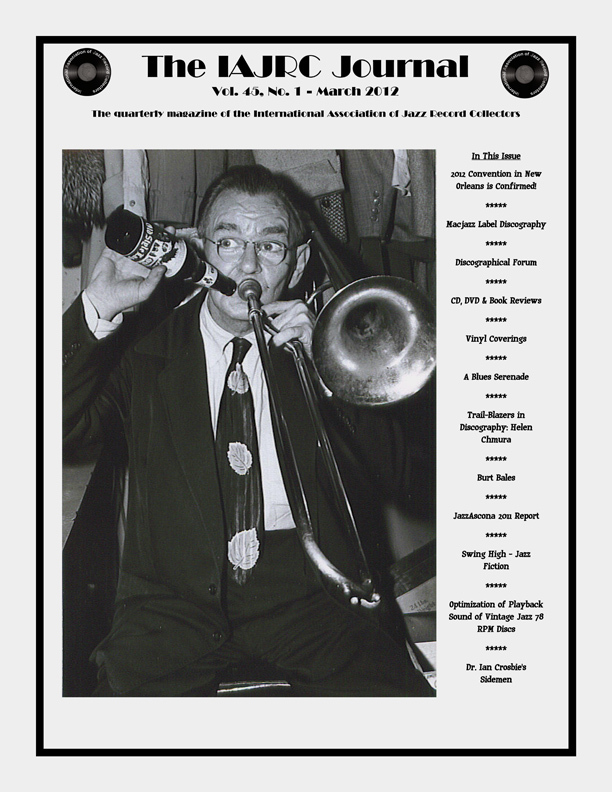 One sign of life is the refreshing friskiness of the Journal of the International Association of Jazz Record Collectors. I would have written this blogpost a few weeks ago but I kept on finding new things to read in the March 2012 Journal . . . so I apologize for my tardiness but it is another sign of life. I was entranced immediately by the cover — a comic portrait of trombonist Miff Mole, taken in Chicago in the early Fifties (courtesy of the jazz scholar Derek Coller): boys and girls, don’t try this at home without adult supervision. 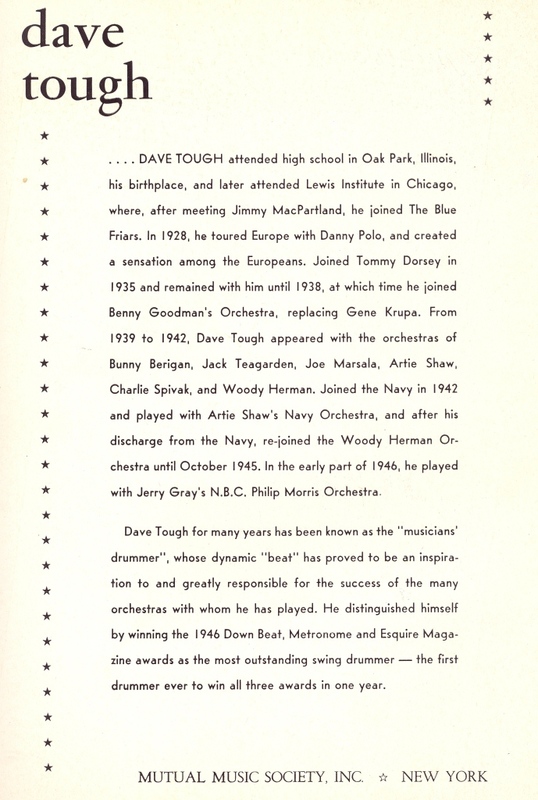 Inside I found Bert Whyatt’s discography of the rough-and-tumble West Coast pianist Burt Bales (including recordings with Bunk Johnson and Frank Goudie), a chapter in Don Manning’s novel SWING HIGH! 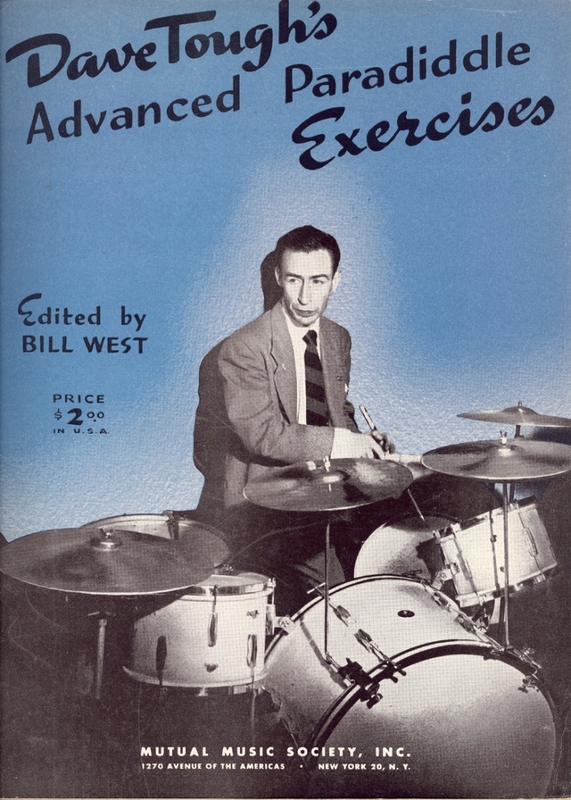 — its subject being an insider’s look at life on the road with a big band in the Forties. I read an extensive affectionate report by Perry Huntoon on Jazz Ascona, and made my way through many CD reviews. There’s more. The IAJRC will be holding its annual convention in New Orleans (Sept. 6-8, 2012) and in addition to scholarly presentations and the opportunity to buy records, chat with fellow jazz enthusiasts, and tour the city, there will be live music, video presentations by Tom Hustad, Ruby Braff expert and author of the new book BORN TO PLAY, film scholar Mark Cantor, and jazz researcher Sonny McGown (the last one having as its subject the eccentric clarinetist Irving Fazola). The banjoist and singer Michael Boving (of the Scandinavian Rhythm Boys) will speak about Eva Taylor touring Scandinavia in the Seventies — with filmclips, photos, recordings never heard — and he will be joined by Clarence Williams’ grandson, Spencer. To join the IAJRC and get in on the fun, click here. To learn more about the convention, click here. The generous jazz collector Sonny McGown keeps surprising me: first with that lovely candid shot of Barbara Lea and Johnny Mince, now with this — a disc that isn’t playable at the moment but may be restored in the near future. 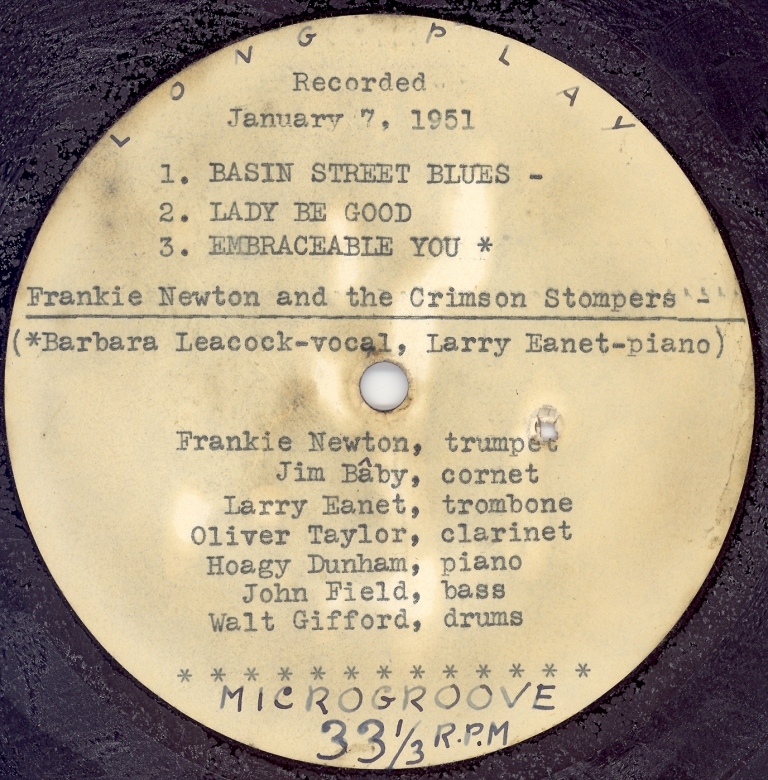 It made me catch my breath at the computer, because not only is it a live 1951 recording of Miss Leacock with the great pianist Larry Eanet, it also features the irreplaceable and (to my mind) under-recorded trumpeter Frank Newton. In 1951. If that isn’t something to dream about in 2012, I don’t know. Thanks, Sonny! Posted in "Thanks A Million", Generosities, Irreplaceable, It's A Mystery, Jazz Titans, Pay Attention!, Swing You Cats!, The Heroes Among Us, The Real Thing, The Things We Love, Wow! One more photograph from Helen Ward’s collection, through the generosity of Sonny McGown, another souvenir of that 1953 Goodman-Armstrong concert tour. 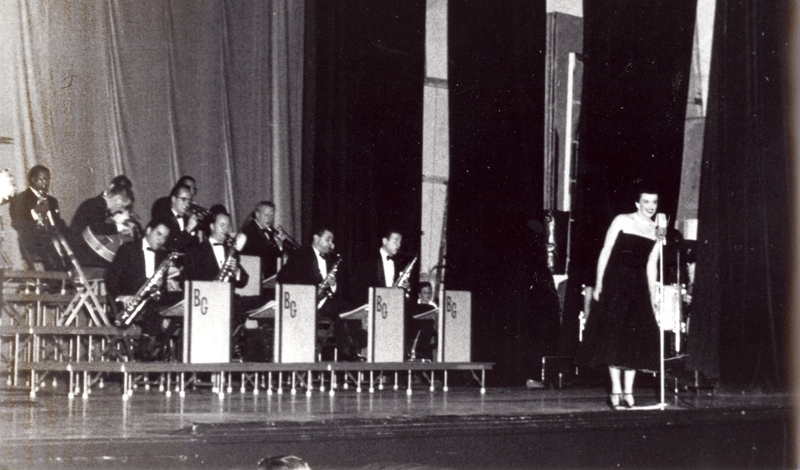 I don’t recognize the hall, but here Helen is in front of the “Goodman” Orchestra. She always sounded the same — friendly, warm, sweetly affectionate — from her first records to her SONGBOOK, perhaps forty years later.